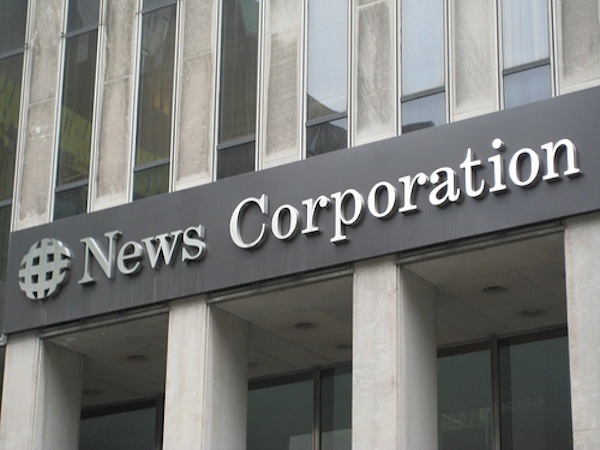 - 2012 BBC Panorama Report on News Corp's subsidiary News Datacom Systems (NDS). - In 2011, Murdoch withdrew from the bid to own the remaining 61% of shares for BskyB, after pressure from the conservative and labour parties. - July 2011, the News of the World phone hacking scandal came to light, with allegations that News Corp were hacking into Prime Minister's and Royals' personal legal documents, bank details and voicemails, etc, along with many other victims and issues being re-raised. Of the possible research topics, I would have more scope for a presentation researching the phone hacking scandal, allowing me to also watch documentaries and access interviews, and statistics, whilst carrying out primary research. News Corp headquarters in New York City, USA. 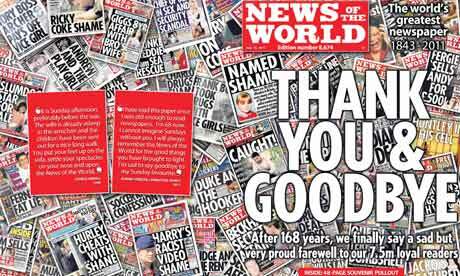 After 168 years News of the World releases it's last issue of the newspaper, due to advertisers boycotting the paper, staff being dismissed and imprisoned, as well as global negative press relating to the phone hacking scandals. I started out focusing on the initial topic, gaining a fresh interpretation of the story through re-reading articles and documents stating the story. "The News International Phone-Hacking Scandal" is also referred to "Hackgate", "Rupertgate" or "Murdochgate" and refers to the ongoing news story relating to the controversy involving News of the World and other UK Newspapers which are published by a subsidiary of News Corporation - News International. Some employees who were said to be involved with the scandal have been accused of various issues such as phone hacking, bribing the police and "improper influence" when it comes to publishing stories in their newspapers. The story was set aside after the scandals which came to light within 2005-2007 when hacking was soley based on celebrities, the Royal family and politicians, which may be to do with his heavy views on politics. However in July 2011, Milly Dowler's phone was accessed, a schoolgirl who was murdered, as well as hacking phones and details of British soliders who had passed away, and victims of the 7/7 bombings in London. When these issues were arose last year, the News of the World came to light, it's employees were spoken too and the newspaper is no longer, with added boycotts from major advertisers contributing to the break down. However this shows the power of a global corporation which is as large, and as powerful as Murdoch's media empire which he has built. Such negative press from the public, media and the government forced News Corp to back out of taking over BskyB, resulting in them not having total control of the TV network. The shocking news came to light, Prime Minister at the time, David Cameron announced publicly on the 6th July 2011 that a new investigation would be taking place, focusing on phone hacking and police bribery, whilst looking into the changing ethics and media of British newspapers and general publishing industry. Many senior staff members were dismissed from the company or resigned, whilst Rupert Murdoch and his son James Murdoch, gave evidence before the Leveson Inquiry - a public investigation looking into the ethics of media and newspapers. A final 2000 page report was filed in November 2011. News spread of the scandal to the US, and since the FBI have set out to see if News Corporation had access to voicemail messages of the victims of the 9/11 attacks in New York City. They have violated many laws and policies by being to fraudulent in recent years, and reaching new depths to gain information for stories, which would capture the public's and the media's attention. Due to the depth of the hacking scandals, Murdoch as CEO, was forced to admit he used a cover-up in previous years to hide the wealth of hacking which had been taking place. Files have been placed documenting that he was unfit to run a global corporation, and was fully aware of what his companies had been up to with their illegalities. By 2002, the practice of publications using private investigators to acquire confidential information was widespread. Some individuals used illegal methods to accomplish this.Victims of illegal phone hacking included celebrities, politicians, law enforcement officials, solicitors, and ordinary citizens. The Metropolitan Police conducted several investigations between 1999 and 2011. The first two investigations were known as Operation Nigeria (1999) and Operation Glade (2003). They involved phone taps and seizure of records that successfully gathered large quantities of evidence that confidential information was being acquired illegally, sometimes with the help of public officials, including policemen. Thirty publications were found to have purchased confidential information, including News International papers The Sun, The Sunday Times, and News of the World. From the 1990s, private investigator Jonathan Rees reportedly bought information from former and serving police officers, Customs officers, a VAT inspector, bank employees, burglars, and from blaggers who would telephone the Inland Revenue, the DVLA, banks and phone companies, deceiving them into providing confidential information. He then sold that information to News of the World, the Daily Mirror, Sunday Mirror and the Sunday Times. News of the World alone paid Rees more than £150,000 a year. Rees was also suspected in the murder of his former partner, and the Met's anti-corruption squad CIB3 initiated Operation Nigeria. It involved tapping Rees' phone to obtain evidence about the murder and about whether confidential information was being acquired illegally by police and/or reporters. Recorded telephone conversations revealed that Alex Marunchak of News of the World was a regular customer of the agency. It was determined that Rees was purchasing information from improper sources, but no evidence became public that Marunchak or other journalists had committed criminal offences or that they were aware of how Rees acquired the information. The bugging operation ended when it was determined that Rees was planning to plant drugs on a woman so that her husband, Rees' client, could win custody of their child. Rees and others whose voices were recorded during Operation Nigeria (including Austin Warnes, Duncan Hanrahan, Martin King, Tom Kingston, Sid Fillery) were successfully prosecuted and sentenced to jail for various offenses unrelated to illegal acquisition of confidential information. Rees served five years in prison. In 2005, he resumed his private investigative work for News of the World, where Andy Coulson had become editor, succeeding Rebekah Brooks as editor in 2003 when she became editor to sister paper The Sun. Brooks had beenNews of the World editor since May 2000, during which time, it later emerged, the tabloid accessed the voicemail of murdered schoolgirl Milly Dowler. Later in 2003, Brooks and Coulson appeared before a parliamentary committee, where Brooks admitted to paying police for information. In August 2006, Clive Goodman, royal editor at the News of the World, and his associate Glenn Mulcaire, a private investigator, were arrested over allegations of phone hacking made by the British Royal Family in 2005. Goodman and Mulcaire were subsequently charged; they pleaded guilty and were imprisoned on 26 January 2007, for four and six months, respectively. After Goodman and Mulcaire pleaded guilty, a breach of privacy claim was started by Gordon Taylor, Chief Executive of the Professional Footballers Association who was represented by his solicitor Mark Lewis. That claim settled for a payment of £700,000 including legal costs. James Murdoch agreed with the settlement. In 2009, and 2010, further revelations emerged regarding the extent of the phone hacking and the number of News of the World employees who may have been aware of the practices. By March 2010, the paper had spent over £2 million settling court cases with victims of phone hacking. In July 2009, The Guardian made a series of allegations of wider phone hacking activities at the News of the World newspaper, that were aimed at other individuals, including television presenter Chris Tarrant. This led to several prominent figures who were covertly snooped upon bringing legal action against the News of the World's owner and Mulcaire. Amongst those who began legal action were Tarrant, football agent Sky Andrew, actors Sienna Miller and Steve Coogan, and sports presenter Andy Gray. On 13 November 2005, News of the World published an article written by royal editor Clive Goodman, claiming that Prince William was in the process of borrowing a portable editing suite from ITV royal correspondent Tom Bradby. Following the publication, the Prince and Bradby met to try to figure out how the details of their arrangement had been leaked, as only two other people were aware of it. After some discussion, the Prince and Bradby concluded it was likely that their voicemails were being accessed. Prince William noted that another equally improbable leak had recently taken place regarding an appointment he had made with a knee surgeon. The Metropolitan Police set up an investigation under Deputy Assistant Commissioner Peter Clarke, who managed the Counter Terrorism Command. Clarke's investigation team searched the London office of the News of the World, eventually concluding that the compromised voice mail accounts belonged to Prince William's aides, including Jamie Lowther-Pinkerton, and not the Prince himself. In August 2006, the News of the World's royal editor, Clive Goodman and a private investigator, Glenn Mulcaire, were arrested by the Metropolitan Police, and later charged with hacking the telephones of members of the royal family by accessing voicemail messages, an offence under section 79 of the Regulation of Investigatory Powers Act 2000. News of the World had paid Mulcaire £104,988 for his services, on top of which Goodman had additionally paid Mulcaire £12,300 in cash between 9 November 2005, and 7 August 2006, hiding Mulcaire's identity by using the code name Alexander on his expenses sheet. The court heard that Mulcaire had also hacked into the messages of: supermodel Elle Macpherson; publicist Max Clifford; MP Simon Hughes; football agent Sky Andrew; and the Professional Footballers' Association's Gordon Taylor.On 26 January 2007, both Goodman and Mulcaire pleaded guilty to the charges and were sentenced to four and six months imprisonment respectively. On the same day, it was announced that Andy Coulson had resigned as editor of the News of the World.